Federal Health Minister Leona Aglukkaq, left, UBC Asst. 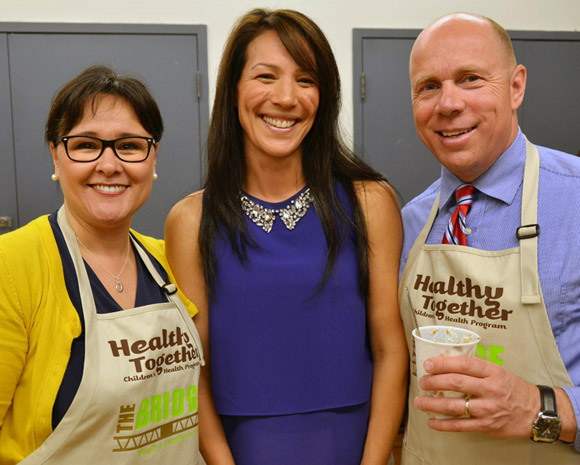 Prof. Mary Jung and MP Ron Cannan were at the launch event in Kelowna for the Achieving Healthier Weights in Canada’s Communities. Jung is engaged in research that will evaluate the strategy over the next four years. Faculty members from the University of British Columbia’s Okanagan campus are heading up the evaluation of a four-year, $1.6-million national strategy aimed at achieving healthier weights in Canadian communities, announced Tuesday by the Public Health Agency of Canada. The Bridge Youth and Family Services in Kelowna, in partnership with professors from UBC’s Okanagan campus, was awarded $1.6 million in funding for their Healthy Weights for Children project – one of 9 national strategies funded by the Public Health Agency of Canada. The Kelowna-based project will use education-based modules to promote and maintain healthy weights for disadvantaged and underserved children and their families, with a particular focus on Aboriginal and minority youth, adults and seniors. Modules address food, nutrition, physical activity, relationships and community support. Prof. Susan J. Wells, director of the Centre for the Study of Services to Children and Families and with a joint appointment in psychology and social work, was principal investigator leading the evaluation proposal. Wells led initial work to establish the partnership with The Bridge, and proposed that Mary Jung, an assistant professor in the School of Health and Exercise Sciences at UBC’s Okanagan campus, lead the research. The evaluation component of the project will assess the efficacy of the modules on more than 300 children and 300 caregivers across Canada. UBC will also train individual site evaluators from the 10 communities across Canada who will be delivering the project during a two-day workshop in September. The modules for the project were developed by project partner The Bridge Youth and Family Services Society in Kelowna in Phase 1 of funding from the Public Health Agency of Canada. “It is a large, complex project,” says Jung. There are distinct challenges across a widely distributed project with rich demographic differences. The 10 communities include Yellowknife, NWT; Bonavista, NL; Moncton, NB; Brantford Ont. ; Temiskaming, Ont. ; Saskatoon, Sask. ; Calgary, Alta. ; Dease Lake, BC; Castlegar, BC; and Vancouver, BC. The national project was kicked off by federal Minister of Health Leona Aglukkaq and Kelowna-Lake Country MP Ron Cannan in Kelowna on Tuesday.